For better or worse I’ve a lot of faith in Apple’s engineers and if they introduce a new feature that I immediately don’t like, I know better than to abandon it and never look at it again. Initially, I didn’t like the new Dark Mode. I’m still not 100% committed, but I’ve experimented with it, and here’s a handful of tips that you can try to make it better. Remember Night Shift, the feature introduced back in High Sierra to shift the whites away from pure/blue white as the sun goes down? This can make a huge difference to the white glare seen within application windows like browsers when using Dark Mode. In fact, in my opinion, Night Shift can make more Dark Mode much more tolerable. So play around with Night Shift. Turn it on 24 hours a day and adjust the slider perhaps towards Less Warm to see what effect you can achieve. On newer MacBook Pros you might also enable True Tone if you’ve previously disabled it. You’ll find both Night Shift and True Tone settings in the System Preferences app—click the Displays icon, and you’ll then find Night Shift has its own tab, while the True Tone setting can be found under the Display tab. If you’ve created your own display colour calibration then this will likely affect Dark Mode a lot. Try switching to macOS’ default colour profile for your display, or try recalibrating with Dark Mode enabled. You can switch colour profiles by selecting System Preferences, selecting Displays, and selecting the Colour tab. More and more apps have Dark Mode features to work with Mojave, so ensure you update all your apps. Note that there’s been reports that the “Sparkle” system used by many non-App Store apps to autoupdate isn’t working properly at the moment under Mojave, so you might need to go to the developer’s website and download a new version there. Twitter: Click your profile icon at the top right and then select Night Mode at the bottom of the menu that appears. YouTube: This only works on the new site design, but again click your profile image at the top right and select the Dark Theme menu option. Reddit: Again, this is limited to the somewhat derided new visual style of Reddit, but select your profile icon at the top right and select the Night Mode switch. Duck Duck Go: Click the menu icon at the top right, and then select the right-most theme option from the four colour circle choices. Gmail: Click the cog icon near the top right, select Themes from the menu that appears, then scroll down to beneath the image-based themes (around a third of the way). To the right of the default theme will be a black square, and if you hover over it you’ll see this reads “Dark”. Select it. 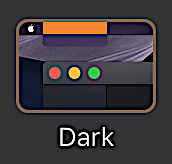 There are actually two versions of Dark Mode. The first is seen if the accent colour in System Preferences > General is set to anything but grey. Set it to grey, however, and you get a harder black tone. Play with it and see which you like. There’s a variety of website style sheet hacks around, including Dark Mode for Safari and Dark Reader for both Google Chrome and Firefox. These force the page to switch the white background for a dark colour, even though it isn’t designed for this. However, in my opinion these rarely work correctly and make sites both look ugly and make them hard to use—things can become invisible. Really, it requires the site’s UI designer to specifically create a dark theme for things to look right. Pending Microsoft Word getting a Dark Mode, you can switch the page to black or a darker colour by selecting the Design ribbon, and then the Page Color icon. If you then select to hide the ribbon, it doesn’t look too incongruous in Dark Mode.